Defects in T cell recruitment to DENV-infected LNs in the MCPT5-Cre iDTR model of MC deficiency. (A) Schematic showing the timeline for DT and DENV injections. Mcpt5-Cre and Mcpt5-Cre/iDTR mice were injected with saline to serve as controls or with DT every week for 4 weeks for systemic MC depletion before infection. Mice were injected with saline or infected with 1 × 105 pfu DENV s.c. into the FP, and the popliteal LNs were collected 24 hours after infection. Single-cell suspensions of LN cells were stained to identify T cell subsets using the gating strategy in Supplemental Figure 1. 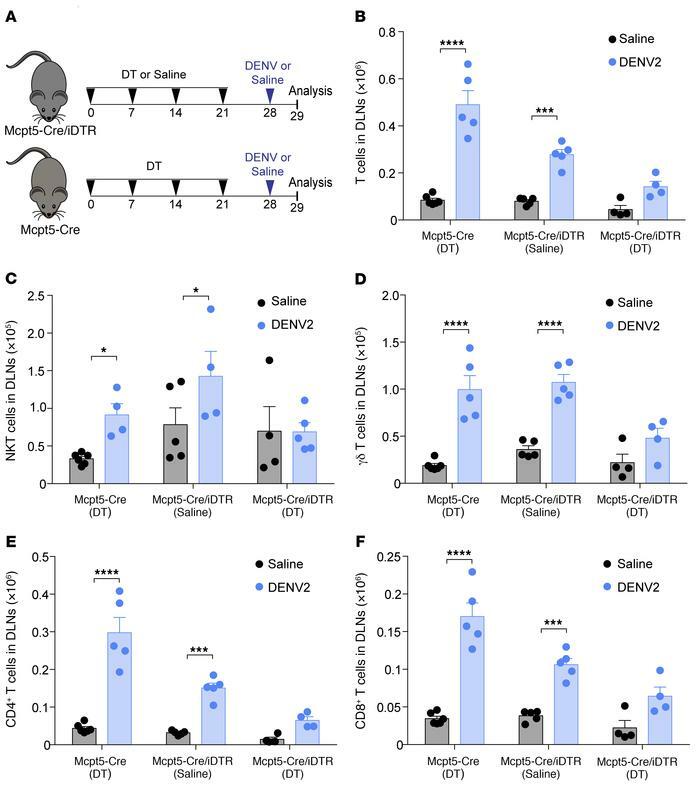 T cell responses to DENV infection were compared among MC-sufficient Mcpt5-Cre/iDTR (saline-injected), MC-sufficient MCPT5-Cre (DT-injected), and MC-deficient Mcpt5-Cre/iDTR (DT-injected) mice. Number of (B) total T cells (CD3+), (C) NKT cells (CD3+NK1.1+), (D) γδ T cells (CD3+γδTCR+), (E) CD4+ T cells (CD3+CD4+), and (F) CD8+ T cells (CD3+CD8+) all showed MC-dependent recruitment to LNs during DENV infection in this c-Kit–independent model of MC deficiency. Data represent the mean ± SEM. *P < 0.05, ***P < 0.001, and ****P < 0.0001, by 2-way ANOVA with Sidak’s multiple comparisons test. n = 4–6 animals per group. The efficiency of MC depletion after injection with DT is shown in Supplemental Figure 4.